Norwich XI: Ruddy; Pinto, Martin, Klose, Brady, O'Neil, Howson, Redmond, Hoolahan, Naismith. That's the live text done. You can see the developing report in Swansea's win over Norwich on this link. For more reaction to Saturday's games, click here. 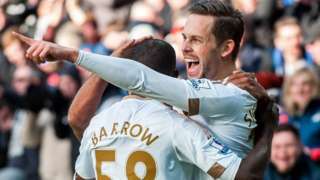 Swansea City move nine points clear of the Premier League relegation zone as Norwich City slip further into danger. A big win for Swansea and a 10th game without a victory for Norwich. They're in real trouble now. Swansea coach Alan Curtis is pacing in the technical area. He looks nervous. Wayne Routledge paces up the left wing and feeds to Bafetimbi Gomis, but he can't get his effort on target. We're into injury time now. Norwich are running out of time...and Sunderland are drawing. Norwich are having a final flurry! Nathan Redmond is a whisker away from striking home, after a horrible clearance from Wayne Routledge. Free-kick for Swansea and it's a good distance for Gylfi Sigurdsson - about 25 yards out. He strikes it well and pang! It clips the woodwork and goes out. So close for the hosts. Bafetimi Gomis replaces Andre Ayew for Swansea's final substitution. Nathan Redmond is caught on the ankle and looks in a bit of discomfort. Norwich have used all their subs so Alex Neil will be hoping he can shake it off. Canaries' Dieumerci Mbokani gets his head on a Wes Hoolahan centre, but it falls into Lukasz Fabianski's grasp. Modou Barrow goes running, running, running. He gets to the byline and Gylfi Sigursson crosses it in but goalkeeper John Ruddy collects. "Patrick Bamford's introduction has brought more movement and urgency to Norwich's frontline. Can he grab his first goal of the season and give the Canaries hope?" Wes Hoolahan flicks the ball over the top of the Swansea defence in the hope of finding Patrick Bamford. The Norwich substitute tries to find the end of it, but goalkeeper Lukasz Fabianski gets there first. Swansea sub Mondou Barrow weaves in from the right, and easily shakes off Russell Martin, before taking a cross-shot at goal. Gylfi Sigurdsson, who's hovering with intent in the box, leaves it and as a result it skims just past the post. Andre Ayew beats the offside trap but goalkeeper John Ruddy rushes forward to collect the ball before the Swansea forward and get to it. "Swansea’s fans want more. They can sense Norwich are there for the taking and want to finish this match off now. The hosts have been by far the better side since half-time and the Canaries are going to have to get back into this game." Patrick Bamford in the mix again. The blonde forward feeds to Wes Hoolahan and the Norwich wide-man tries to pass it across the box but can't find a team-mate. Gylfi Sigurdsson now has eight goals for the season. I wonder what new Fifa president Gianni Infantino, who is at the game, made of that? Norwich loan forward Patrick Bamford, who's only been on the pitch for a few minutes, tries to poke home from close range but keeper Lukasz Fabianski saves. Swansea's goal has completely opened up this game now. A brilliant ball from Ashley Williams finds Wayne Routledge, but his effort is saved by Norwich goalkeeper John Ruddy. 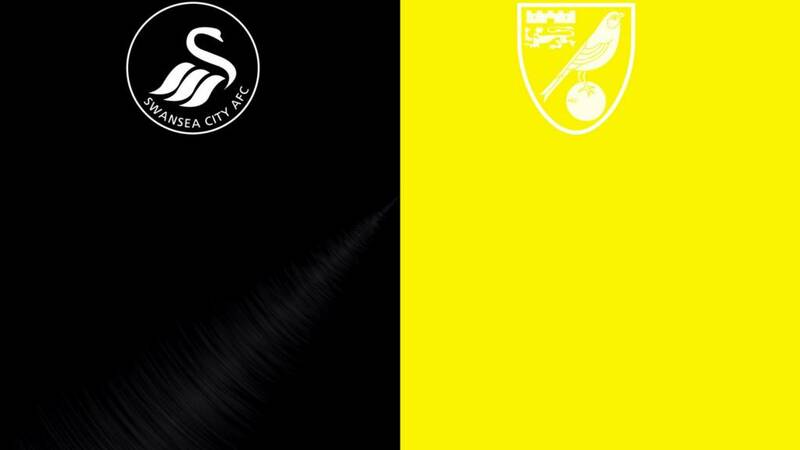 Swansea look far more up for this now. Norwich are hanging on. Gylfi Sigurdsson is starting to run the show here. He's played in from the left and he rushes into the box, tries to square the ball, but it's cleared by Norwich for a corner. The balls comes flying in from the left before being collected by John Ruddy. Swansea are really chasing this now. Andre Ayew attempts to square the ball across goal, but it’s cleared. Norwich have gone for a double substitution: Patrick Bamford is on for Steven Naismith, and Dieumerci Mbokani is on for Cameron Jerome.